H x W: 16 in. / 22 in. Harper's Weekly, A Journal of Civilization was an American political magazine based in New York City. Published by Harper & Brothers from 1857-1916, it featured foreign and domestic news, fiction, essays on many subjects, and humor, alongside illustrations. 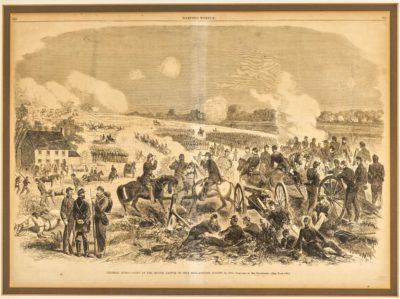 It is perhaps best remembered for carrying extensive coverage of the Civil War, including many illustrations of events from the war, like this example. It is possible that this print is from the December 27, 1862 issue of Harper’s Weekly, the same issue as the cover print with the Battle of Fredericksburg, which is in The Army and Navy Club’s collection (1891.10).